You are at:Home»Great Falls Montana»Around Town»Men seldom make passes…? I’ve heard that Dr Ozog is a great ophthalmologist, and also that he is an all-around good guy – but this ad for his LASIK practice just ain’t right. “Don’t let glasses ruin the moment” – what the heck? Implying that wearing glasses somehow diminishes a woman’s beauty…ouch. Speaking as a man who is in love with a woman who wears glasses – and looks great wearing them! – I call foul on this ad! Ozog is proof enough to me that idiots still roam the earth. Wow, this is entirely subjective. Also, depends on the person and the glasses and your relationship to the person in the glasses. A blanket statement about whether glasses enhance or diminish someone’s attractiveness would be… foolish, Mr. Bond. Did you see this video about the experiment ABC news did about this very thing? Depending on who, or who may not be wearing glasses at any point during the day, it is always the same ole deal. Ads will play on the presumed weakness or frailty of the American public. Thinking that life is unfair just because you might have to wear glasses is a bit of a stretch, don’cha think? Or is it that we’ve become so conditioned by society, our peers, and the media, that things like glasses will always be looked upon as a weakness or just plain oogly? Here’s a bit of news … Life can be fair, regardless of whether or not you wear glasses. If folks think they might be unattractive just because they are wearing glasses, well, then, there might be other, deeper, things at play than just the glasses. And, if upon reading an ad, that makes reference to glasses making people oogly, and you, being a potential glasses wearer believes what the ad says, then you may end up becoming just as much of a facade as the ad itself is. 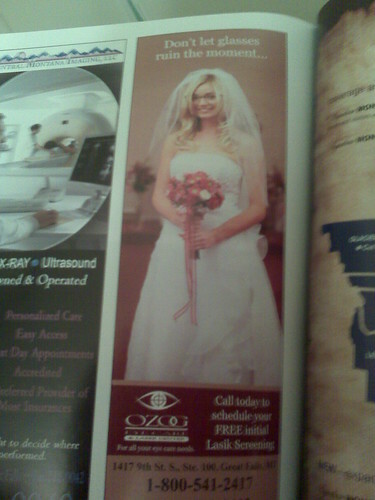 I saw this ad in the local wedding guide distributed by the Trib. I thought it was a very event-specific reference. I watch a lot of wedding shows and I cannot recall seeing a bride in a wedding gown AND glasses in one of them. In my opinion, it’s the one day you pop in your contacts for sure.